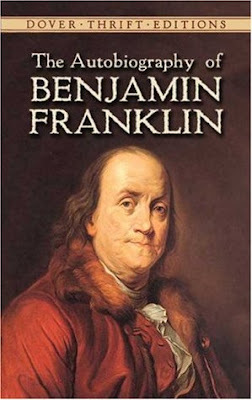 "The Autobiography of Benjamin Franklin" is Ben Franklin's second most interesting work, his first being his "Dissertation on Liberty and Necessity, Pain and Pleasure". In his autobiography he explains in one long paragraph how he trained himself to be a good writer of prose. I'm going to think about his methods, but probably go my own way. Franklin took short notes on some pieces of writing that he liked. He set them aside for a time, came back to them and tried to recreate the piece. Then he would compare his version with the original. He also would take an original piece and turn the prose into poetry, put it aside for a time, come back to it and turn the poetry back into prose, thereafter comparing the new piece with the original. I consider Benjamin Franklin one of the most interesting personalities in history, and this is no less so. I am going to work with "Replay", the greatest novel of all time, even though it intimidates me a bit. I believe I may be able to almost copy it, to mimic it. This could be applied to subject, structure, or style. I am going to start with a paragraph by paragraph method. Stephen King talks about the paragraph being the fundamental piece of writing, and to a large extent I think that is true. So, let us begin with the first paragraph, which is one sentence in this case. I don't think there is a better opening line. The last word is a surprise, and only the last word. Jeff Winston was on the phone with his wife when he . . . You could put a lot of things on the end of that sentence and it wouldn't be surprising, but died is so captivating. How is a story to even continue after that opening line? It sounds like the ending of a tragic story rather than an opening. Let's see if I can do something like that. A person was doing something normal when something not normal happened. That is the format of this sentence. Tom Brooks was eating an apple when . . . I don't want to use died, because that is too close of an imitation. I also don't like eating an apple as much as talking on the phone with his wife, that just brings up so many questions and is strongly emotional in a very serene manner. Something for the end, I need something for the end. Tom Brooks was eating an apple when . . . the phone rang. It's kind of the same format, but in a boring version. Tom Brooks was reading the newspaper when the lights went out. Okay, that's better, a bit ominous. It brings up some questions, I want to know what will happen next. Wow, that is a lot of thought and writing to just get a mediocre first line. The next paragraph has two sentences, so let's see how that goes. That is an excellent second paragraph. Let's see what I can come up with. "Terror in downtown . . ." he was reading, and he never got to read what the terror was, because something crackled outside, the lightbulb flashed and burst above his head. The newspaper fell from his hand as hot glass rained down around him in the dark. Oh man, I like that a lot better than I thought I was going to. Let's compare the two pieces against each other now. First, the first two paragraphs of "Replay" by Ken Grimwood (the greatest novel in existence). Now we will go with my innovated/adapted imitation. I like it. This is going to be quite the effort. A lot of time, energy, and attention will be required, but it's also an enjoyable process. It's interesting that the words have a feel when you're writing them. Brandon Sanderson mentioned in one of his classes that he knows of successful authors that literally re-typed the works of authors that they liked. I think this is much better, it is making you reach, it is making your neurons fire trying to fill in the gaps and fill the space between imitation and innovation. I believe there is progress to be made here.